The title sounds so exciting doesn't it?!?!? It's okay if it doesn't flutter your heart. You won't hurt my feelings. 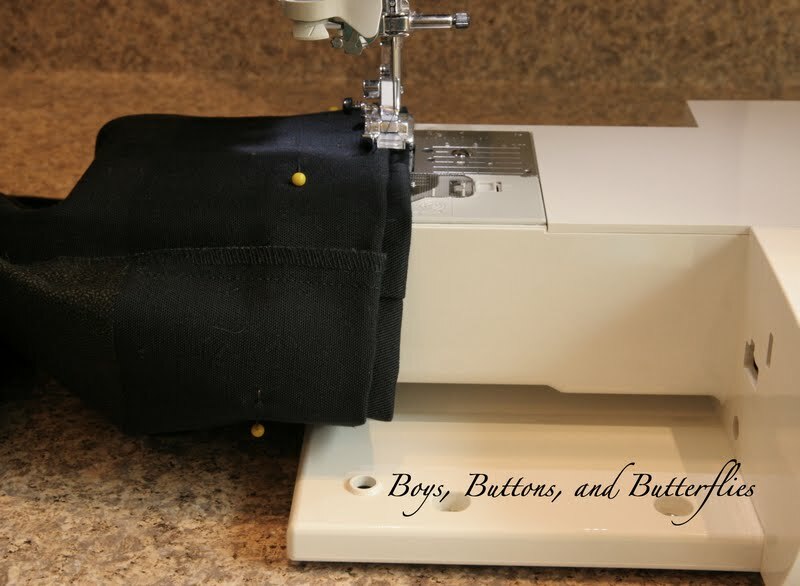 But since I have been in the Back to School mode, I thought I would share something that most sewing machines have as an option and not many know what it is for, or how to use it. DO YOU NEED TO SHORTEN SOME NEW PANTS? Every school year, I am faced with a dilemma. Mr. Bean boy has very short legs. His torso is as long as his older brother. Therefore, I have to buy pants that fit the waist, but drag underneath his feet. Usually, I don't have to do this until the winter time. However, this year, he is in middle school and he is required to wear pants on Friday's for School Mass. So I torture him by having him let me mark his new hemline. Heaven forbid he stand still for a few minutes, right? The difficult part of hemming a pair of pants is that you don't always want the stitching to show on the outside of the pant leg. It is also certainly EASY to buy some hem tape, but I can promise you it won't last long if your children are like my boys! Or you could torture yourself by whip stitching by hand. 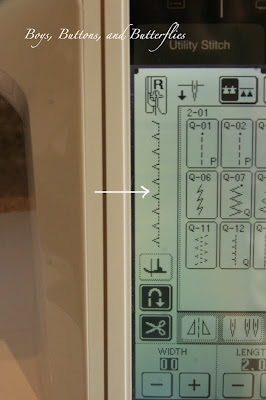 Again, I can't promise every sewing machine has this feature, but most will! And if not..there is an alternative. 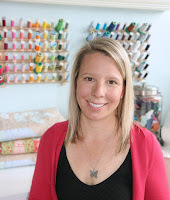 The sewing part is actually the easiest, but the preparation can get a little confusing for some! Except for the crease...I hadn't washed the pants yet to get rid of all that sizing they put in clothes these days. The crease came out nicely in the wash. I was remiss on taking pictures of the marking process, but there are two easy ways to mark where you would like our hem. One way is to just grab a pair of pants that are the right length and lay them on top of the pair that need hemming. Just mark with a pin or chalk. The second way is to have your subject put them on. Then you simply fold the bottoms up until the fold lands where you would like. I went a little crazy with the labeling but I wanted to make sure you had a place to reference back to if you get a little lost! As you can see, I took off a tremendous amount off the bottom! I told you he had some short legs! The yellow pin marks the hemline I found by having him wear them. 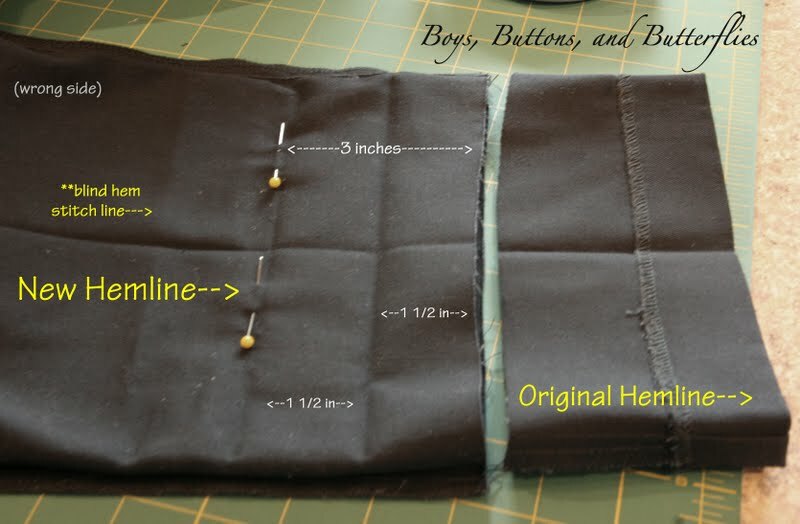 I made an allowance for an 1.5 in hem with the excess of 1.5in for a total of 3 in. He needs to wear them for the entire school year, and I would prefer not to have to buy new pants. If I wasn't anticipating for the next 10 months, I would have only had a 2 in hem ( 1 1/2 in hem with a 1/2 in fold). Measure the first 1 1/2 inches and press with iron well. 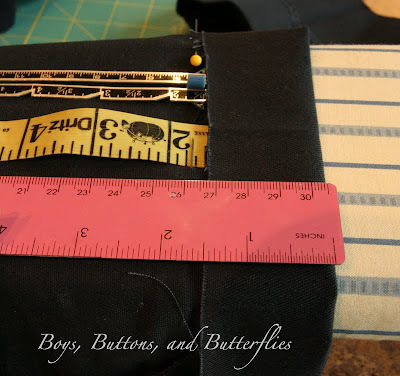 I wanted to show you that you can use ANY type of measuring tool to find your 1 1/2 inches. Seriously, grab anything. I personally like my EZ Hem Gauge, but with these small width leg pants, it isn't very practical, so I use my hem gauge (the one on the top of the photo). Fold and press the next 1 1/2 inches. You will now have a hem line and what I call the fold line. 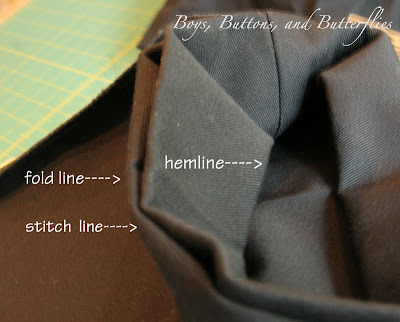 Step Four: Prepare the hemline and fold line. Getting this right is probably the hardest thing to explain, but I am going to give it my best. If it doesn't seem to be explained well, I may hire the boys to videotape this step! You are going to grab the hemline and turn in into the "hole". 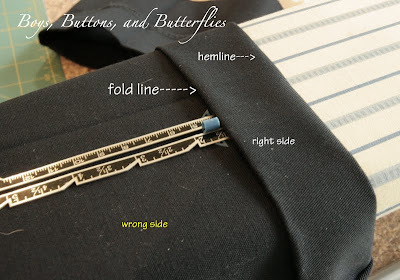 You are going to have have the fold line (figure 3) meet your stitch line (figure 1 and 3). It will look like a double fold. You will then push the fold line about 1/4-1/2 inch away from the stitch line. Can you see that in Figure 6? 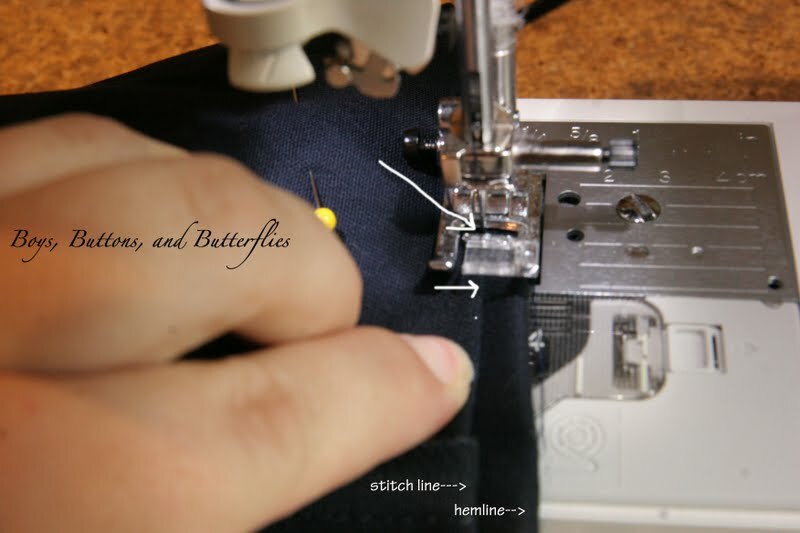 Prepare you sewing machine so you can access your arm. You simply slip the pant legs over the arm. I never start the stitch on the seam. It is too bulky. 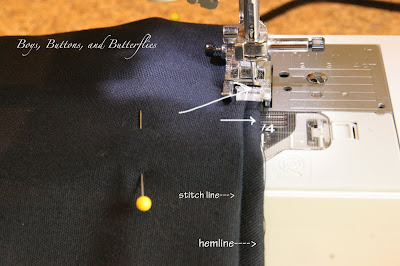 I start about 3-4 inches before the seam..depending on the width of the pants. 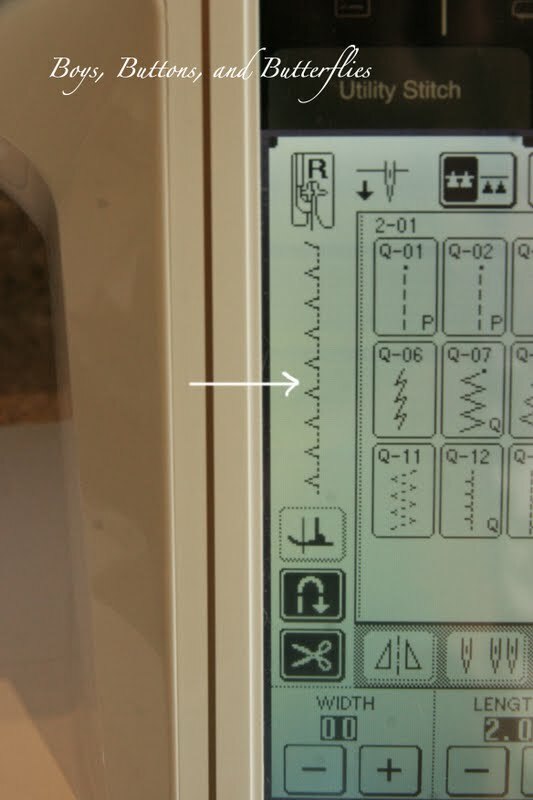 Find the Utility Stitch selection on your machine. The stitch is usually indicated by the open triangles and straight stitches. My machine comes with a special foot, but you can very well use a standard/satin foot. I actually forgot to change mine for this tutorial and had no difficulties. Would the foot have helped? Whenever I start this stitch it always begins on the RIGHT side of the stitch line (which is actually your fold line portion). 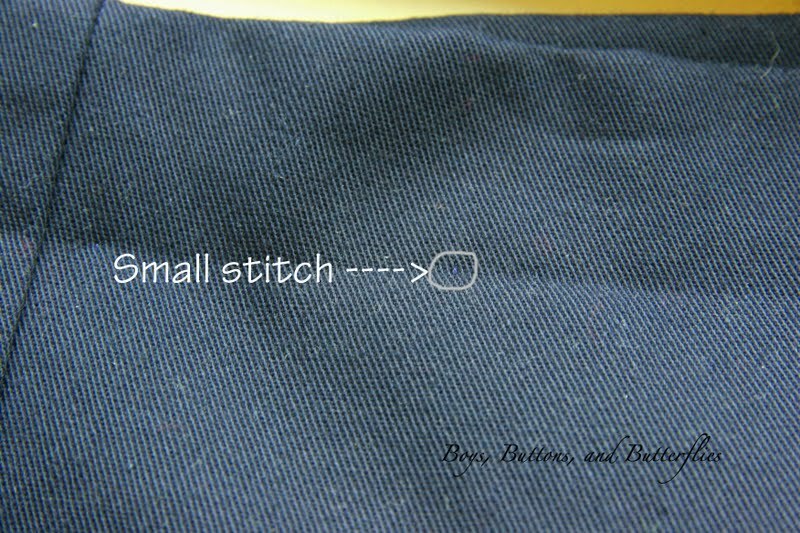 The needle will do the straight stitches on this portion of the fabric. 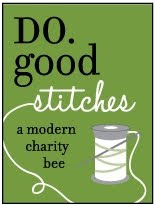 After a few straight stitches, the needle will go to the left side capturing a small portion of the stitch line. Then it will return to the fold line and take a few straight stitches. It will continue to grab the stitch line. 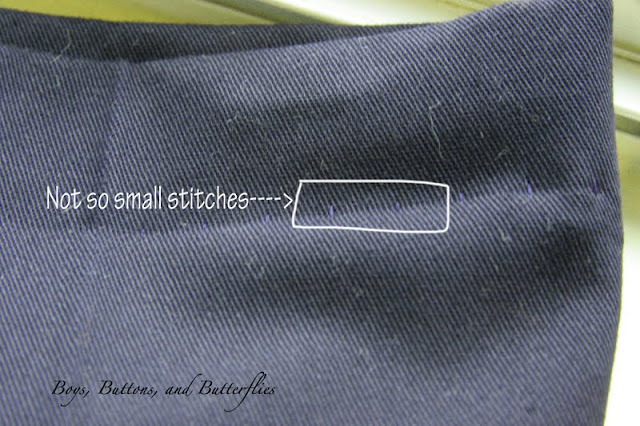 I highlighted the stitch in the white to show you the movement. I also marked the times I was not paying attention and took too large of a stitch to the left. If you grab too much, it doesn't look "blind" on the front. 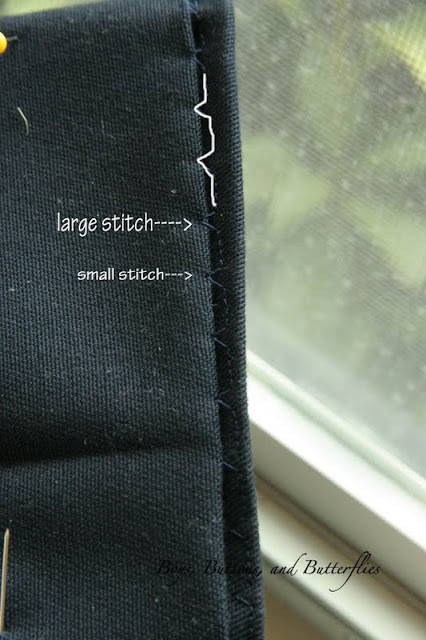 You want more of the smaller stitches for a cleaner look. NOTE: If you do not have a blind hem setting, you could use your straight stitch and then every 4th stitch switch it to a larger zig-zag stitch then return to a straight stitch. It would be a bit tedious, but I did have to do that with one of my basic machines when I was in a jamb a while back this year. 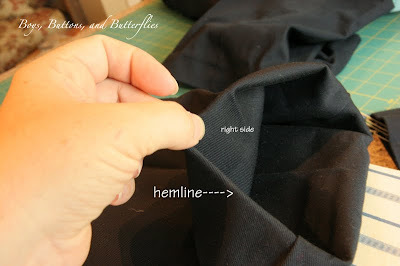 Step Seven: Fold out your hem and press! 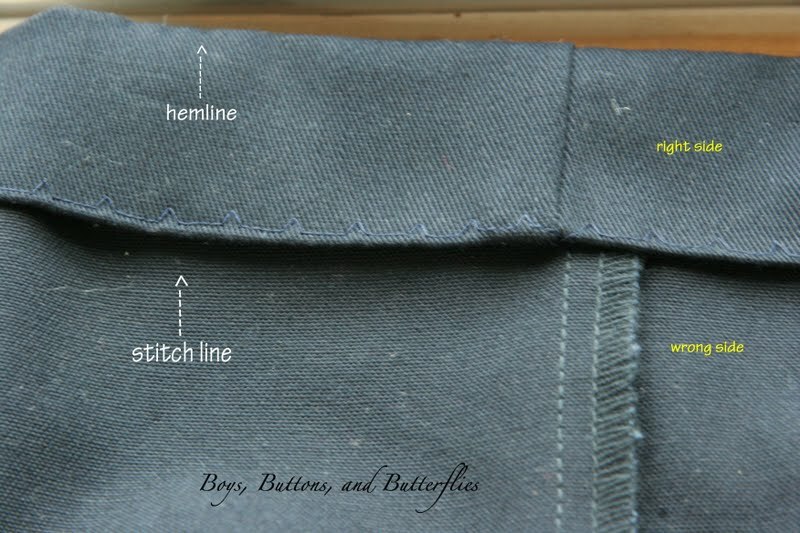 You can see the backside of your stitches on the fold line when you fold the hemline out of the pant "hole". And you can see where you took very small stitches for a beautiful finish? Or you took NOT so small stitches! If you did take large stitches, it isn't the end of the world! 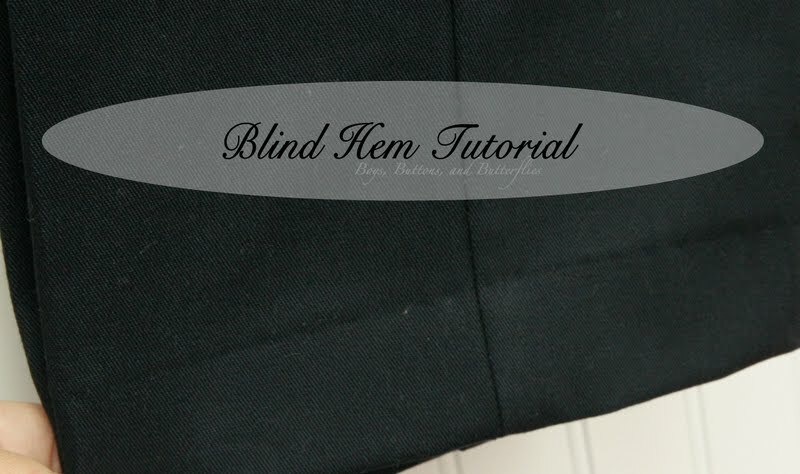 I examined the work that was done on the hem lines of both the pants and shorts I bought and I have to say that there was many a pair with some large "blind" stitches!! Good luck and feel free to ask questions...it can get confusing! Thank you for this tutorial! I tried it on a pair of my son's pants that were way too long and they don't look bad. They were slippery fabric/track pants and had piping down the side so blind hem might not have been the best way to do it but I wanted to try it out. Thank you so much for this tutorial! You saved me, really)) My husband's pants need to be shorten before his speech tomorrow. He was so mad, saying "i hate my dissertation already, i feel that i won't present it tomorrow. Especially in those awfully long pants'. I'm not a pro, but I could do it because of you. Thank you so much!